Website: This week has seen the launch of our brand new shiny website. Our very own Matt Jones has committed a lot of time and skill in doing this and has done an absolutely amazing job. EGM: Don’t forget an EGM has been called for the 21st Feb, before the London Falcons game. This is to elect a new secretary. The application forms for this role have been sent out, If you did not receive this then please get in touch ( secretary@cardiffdragonsfc.co.uk ) and I will send you out one. If you would like more information regarding the role, please get in contact with anyone from the committee who will be happy to help. This week we will be preparing for the match against London Falcons and we require everybody’s help. We will be conducting a team meeting at Y Mocyn Ddu pub at 8:30pm in the Sophia Garden complex where we will discuss the game and tactics for the weekend. We will then be aiming to play an 11-a-side match against each other on the AstroTurf at 9pm onwards. We need everybody available to make their way down for the 11-a-side game. It will be a fun game and a great opportunity to enjoy and to impress the management team in a match situation also. If you do not wish to attend the team meeting, then the match will begin as soon as possible after 9pm. We understand that on Wednesday it is Champions League 2nd Round, but please do your best to make it down, we all will miss it too! Next week we will be working on 5-a-side training at Gol Centre on Thursday night ahead of the Leeds Tournament on March 14th. Cardiff Dragons will be playing our first match of 2010 vs London Falcons, the current league leaders. We would love to see as many members there as possible to support us. We will also be out in town on Saturday night having a few drinks and unwinding before the big game, meeting in the Kings Cross at 8:30pm. The plan is to meet for the match at Uni Fields at12:30pm as we will also be conducting an EGM to elect a new club secretary. To cover the cost of the pitch and referee we will be asking for £5 subs. Further details of the day will follow. Availability forms are now out for the Leeds 5-a-side tournament weekend. We haven’t had much response at present so could people try to get forms back ASAP. We are hoping to field 2-3 teams as we did last year, the event is good fun and the night out on Saturday is also worth attending. The availability form is attached. Please return this form to Murray (afm11s@cardiffdragonsfc.co.uk). The deadline for returning forms for this tournament is Sunday 28th March 2010. We may be limited to the number of teams we can enter so please respond as soon as possible before the deadline to guarantee your place in a team. We are still awaiting on quite few availability forms for the trip to Edinburgh. The form is attached and should be returned to Murray (afm11s@cardiffdragonsfc.co.uk) ASAP. By Sunday 28th February, we have to have all forms returned and a deposit of £25. David Keith will start collecting deposits on Wednesday night. Please do not hesitate to contact us if you have any issues you wish to discuss regarding the trip. We will be travelling up on Saturday and returning on Monday (2 nights). We have decided to take a minibus for this trip as it will keep costs down. Big thanks to Amy who has volunteered to do the driving for this event. We are encouraging people to support the minibus as the more people we can get onto it, the cheaper it will be. The expected cost of the minibus will be £30 each (if full) and the expected cost of accommodation will be £48. This should be the big event in the Dragons year, an outing to Scotland, hopefully as many people as possible can attend. We will not be sending a team to Cologne this summer. If individuals are interested in travelling to Cologne and either supporting or participating in the tournament, they will ultimately need to make their own arrangements. Please contact Murray (afm11s@cardiffdragonsfc.co.uk) or Ray (chairperson@cardiffdragonsfc.co.uk) for further details as we can help you get to Cologne. We are confident we will be able to hook people up with other clubs from the GFSN to compete in the event. We will be trialling 5-a-side on Tuesday night in the coming weeks, the idea being to offer 5-a-side on a Tuesday and 11-a-side on a Thursday. Kit Check – we are carrying out an equipment and kit check this week, if you have any items hanging around by accident please make us aware. We have selected the squad for the London Falcons match, the squad and team will be announced in the next few days. The Dragons had their first Anti-valentines social on Saturday night, when a selection of sad, single Dragons went for a curry at Radhuny, on City Road. A good night was had by all (and far too much food!). These events give everyone an opportunity to relax and have fun so please come along whenever your free to our many social nights. We are going to be having a coffee night at A Shot In The Dark, on City Road, on 24th March. It has been over a year since we were last there, but it is a fun night and a great chance to chat. Details to come nearer the time. 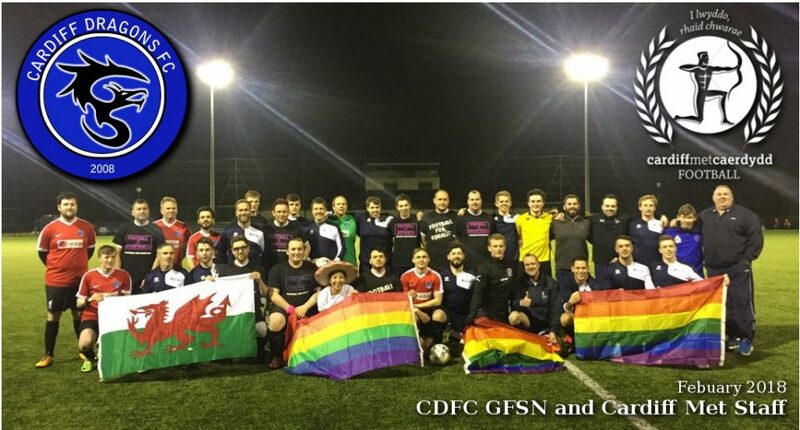 Please get in touch with Richie Jones( welfaresocial@cardiffdragonsfc.co.uk ) for more information or to put forward your ideas and suggestions for future socials. Valentines day has gone. Now you can spend your hard earned money on the most important person, yourself. Don’t forget to buy through http://www.easyfundraising.org.uk/cdfc .You can register free, select Cardiff Dragons Football Club as the organisation you wish to support and shop at all your favourite online shops. A donation is made to the club from the shop with every purchase you make at no extra cost to yourself. Right now many of the big name car insurers are offering some fantastic deals matched with some very generous donations so whether they’re still driving round in their old banger or have splashed out on a brand new motor, your supporters can find the best deals and the biggest donations with easyfundraising. Full credit has to go to Matt Jones this week. For not only has he done the new website, but on Wednesday night he became GI JONES!! After a ball cleared the fence at training Matt crawled on all fours through the undergrowth and scaled trees like they were nothing in a bid to retrieve said ball. With helpful assistance of myself and Dave Keith (we pointed and laughed!!) Matt managed to come back with three new footballs (unfortunately not the original one) and no injuries!! Muzz’s Captains Log will be uploaded weekly onto the new website www.cardiffdragonsfc.co.uk. Check it out there. Fantasy Football: Well done to Mark Biggs for being the highest scorer this week with 50 points. At the top of the league Ed is now only 98 points ahead from Anthony Read (Me)!! I think he is starting to worry!! And another well done to Mark, this time he is first place on the Six Nations Prediction Game, leading from Jerry in second place.